Although CSS3 @font-face is supported by most major browsers (IE, Firefox, Chrome, and Safari), but not all. When it doesn’t, your custom fonts might break the layout or come out with undesired results. In this article, I will explain the common issues with using custom fonts, picking the matching fallback web safe fonts, and how to create a perfect fallback font style with Modernizr. One common mistake that most people make when implementing custom fonts is not specifying the fallback fonts or picking the wrong fallback fonts. When using custom fonts, it is important to include the web safe fonts as fallback. The fallback font helps to keep your design looking consistent when @font-face is not supported or available. The key point for selecting fallback fonts is to pick the web safe fonts that best match the custom font. For example, if the custom font is Clarendon, then the best web safe fallback font is Georgia because they both are in serif classification and they have similar font width. Because every font face has its own width, height, weight, kerning (letter-spacing), etc., some fonts are not substitutable with the web safe fonts. Take a look at the example below. 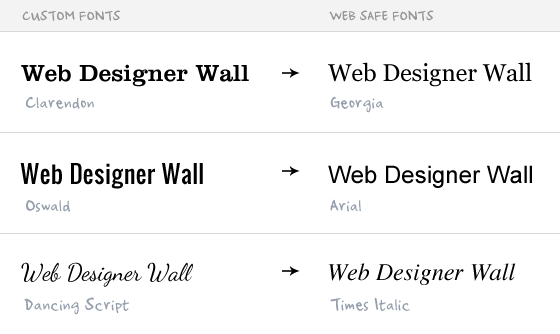 It is a comparison between Wire One (custom font) and Arial (web safe font) at 36pt uppercase. As you can see, the Arial text takes more than double the space compare to Wire One text because Arial has a wider width and kerning. This might causes layout issues as shown in the image below where the fallback font extends off the boundary. So we can use Modernizr to detect if @font-face is supported and then provide matching fallback font styles. For instance, you can adjust the styles for the fallback font (size, letter-space, weight, text-transform, etc.) to best match the custom font. To implement Modernizr, you need to download a copy of Modernizr and include it in the html document. Then you will need an additional rule for specifying the .no-fontface. Check out this demo to see the final result. The demo url is fixed now. Nicely put article, and it will help me. I did not know about Modernizer up until now. Yeah, a very helpful text, thanks! I’ve been thinking about using @font-face and this article gave me clues (and solutions) about possible problems. This post explains very nicely about custom fonts, picking the matching fallback web safe fonts, and how to create a perfect fallback font style with Modernizer….REALLY A GOOD WORK!keep it up! and keep updating us! Nice job. Very well put together article and full of useful info. I am not really getting why Modernizr does this better, especially when it’s adding more load time to your page and does (as far as I can tell from this tutorial) exactly the same thing as backup fonts in CSS. Can anyone clarify if I’m missing something? If you observe the examples, using the no-fontface class, you are not only changing the font, but also changing other characteristics such as size, weight, etc. Example shows Wire One 48pt upper case, with a no-fontface fallback of Arial 26 normal. Simply adding Arial to the font stack would result in Arial 48 upper case. So, basically, you can style your no-fontface font to fit the space provided in your layout. It’s a complete alternate style fallback that results in a similar-enough experience for all users. I see now. Sorry I’m a bit new to advanced CSS/etc and didn’t pick up on that. Thanks for the clarification! Great article. I’m planning on using modernizr on my next project! Thanks for pointing out the importance of fallback fonts, Nick. I’m with ya! Obviously not ready for production. Typekit also provides some control that looks like it does some of what Modernizr is doing above. But what happens if the browser supports @font-face but the font is not found (‘Wire One’ in your example)? Will we still see the fallback font out of boundary? Back to the example, if the browser supports @font-face but the font ‘Wire One’ is not found we will see Arial 48px instead of Arial 30px, correct? The browser downloads the font from the server and loads it. If the font not found on the server due to error, or the browser can’t load the font then you are right, the original 48px arial will be displayed. There is another css3 property – I hope will be implemented in browsers – is the font-size-adjust, which basicly sets the font size by the x-height, not the capital letter height. This is also useful for font fallbacks. Unfortunately it is only implemented by Mozilla right now (who proposed the property and in Firefox since 1.0). Thanks much for clarifying some things. I have been “playing” around with @font face a bit and have run into snags. May you cover a tutorial on modernizer and how to use this library effectively? Nice resource I have many website that could use this fallback thanks! Nice article on web fonts! There’s one thing I miss. In my opinion the biggest problem with web fonts are not the browsers that don’t support @font-face, but those that do support it but don’t render most of web fonts correctly. I’m looking at IE on Windows XP. Even with clear type activated, the masses of web fonts look bad. I don’t see any other solution than UA sniffing here, but maybe there’s something else? The script adds a conditional statement that you can use to add a custom class and switch between different fonts. In my testing I’ve discovered that some fonts do look OK in XP. Great post. I’ve heard of modernizer but never really looked into it. In my mind it was the same as PIE for ie CSS3 support. Thanks for the clarification and clear presentation of graceful degradation. I learn a new thing, it save my time to edit those styling text. Previously I am so painful to create such text in images format. The best is, you covered web safe fonts part for unsupported web browser. Helpful tips if you really want to use custom fonts. I still have no problems using old fashioned fonts, or creating images with descriptive alt tags behind them. Hey Nick, another wonderful tutorial! Thanks! I’m working with @font-face and I’ve found that your tutorial is so useful. This is very nice post. thank you. 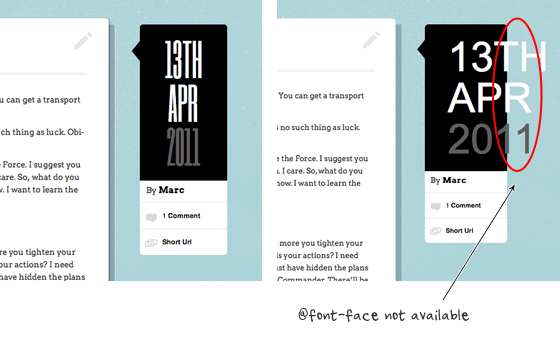 For a post highlighting @font-face, it has an extreme dearth of @font-face content. None, to be precise. And especially nothing particularly CSS3. You mention fallbacks, which any designer worth their weight in artistic poseurishness knows. Then you shoehorn the modernizr JS lib which ‘automagically’ does stuff for you as far ask checking for capabilities. Which would be a perfect time to talk about the actual @font-family issue. The differences between using .EOT .OTF/.TTF .SVG fonts, their requisite support in major browsers, maybe the previous commentator’s recognition of IE’s decidedly lackluster support for any sort of decent hinting/smoothing for webfonts and how that basically breaks the spirit of webfonts….. I don’t know. Couldn’t help feeling letdown by this article, or at least it’s misleading title. Nice article. I know some will not like this but I’m not sure that @ffont-face is such a good idea. Could that lead us to a lot of pages which are illegible? We already have too many of those and giving designers a broader array of fonts may not be in the best interest of users. This we shall only see with time. I hope I am wrong! Will tweet this article. Comment from Pam! I love this site! Very nice and simple explanations. I was still reluctant to start adding custom fonts, because of the mentioned bugs. It never occured me to run modernizr! This article is so useful. Thx. Very useful tips and time savings tips. I really don’t know that using custom fonts in my blog is that easy! Thanks to Modernizr! Great short article very useful and direct to the point. Nice to know about the Modernizr script, thanks for sharing this. Great tip. I didn`t know that was possible to use non default fonts. Thanks for the great tip! And thanks to Modernizer’s author/s! So i guess we dont need to write fallback fonts to WireOne since theres a specific fallback script? Ah I always make that mistake of not including a web safe fallback font, or any fallback font at all! Interesting tip. I still feel @ font-face would still take sometime for the developers to start using it, as it has its own fall outs. that’s cool, never used it before. Thanks for sharing the popular mistakes as i am also one of the those who commit mistakes as the same way as explained above. Love the idea of using modernizer to protect the layout when fallback fonts need to be used. I have also noticed that custom fonts don’t display correctly on mobile devices (even when using Droid font from Google API on an Android phone). Any solution for that? A unilateral mistake is where only one party to a contract is mistaken as to the terms or subject-matter contained in a contract. This kind of mistake is more common! can be do it simply follow the instructions. Thanks for clarifying “how to do it” … easy when you know how! Great post!! Especially to suit your Mobile Phone!! You bring up some good points out about styling breaking if correct fonts aren’t used. Do you know it? What is your opinion about it? Thanks this is very helpful.I am facing the same probelm but now it solved. Good stuff.. I must experiment with some nicer looking fonts for my sites. I’m currently working on a website and this is very helpful. Thank you! Great use of modernizr for this., but wouldn’t the last css-example still give layout issues, i.e: a browser supporting @font-face but lacking font ‘Wire One’ would fallback to arial font-size:48px NOT arial font-size: 30px. Great useful article.Thank you for sharing. maybe… /* no-faceface fallback */ is should be /* no-fontface fallback */ ? I love your blog and i love your ideas.i was having trouble with font selection and spending too much time to select the right one. Now i think this article may help me. Thanks a lot. I will surely use these tips in my blog Blogger Tricks. Amazing tuts thanks for sharing it at one place.. In your demo example the Google font “wire one” is used. Is it possible to use a font like for ex. Helvetica. You don’t have to include the Modernizr js when using the Google fonts I think? great examples i would not of thought of testing a fallback font to make sure it stays within boundaries etc. good suggestion and post. same here…not taken care about fallback, text size etc., thanks for this great tip. What is point of having a fallback font for your fontface style if it’s going to just fall back to your non-fontface solution? Is there a website or a way that we can test to see if the script works? If I remove the custom font from my remote server whilst using the modernizr fallback as explained above, it doesn’t seem to pick up the modernizr fallback font. Am I testing it the wrong way? If I understand how Modernizr works correctly, it’s testing your browser to see if the browser supports @font-face. Whether or not your page actually uses @font-face isn’t tested. The fallback class is only activated if you are viewing the page with a browser that doesn’t support @font-face. I think Google Fonts you shouldn’t have any problems with fonts not rendering, and you don’t have to worry about backup fonts. Since fonts load via Google. I never had a problem with it. It does not work with Firefox when web fonts are disabled (about:config > gfx.downloadable_fonts.enabled > false) and all the content is displayed with fallback fonts (e.g. Arial). So how can I test it? I was thinking of finally going wild on my site redesign and finally breaking away from websafe fonts but wasn’t sure if it was a good idea – think i’ll give it a try with this fallback! Thanks!